kit building was an order of magnitude better than "store bought" just because it was fun, much less expensive, and "YOU built it"
homebrew was more challenging than kits and provided a real electronics adventure AND education ....but sometimes "it didn't work quite right"
"mobile" meant an 8ft whip and a big homebrew "bug catcher" bolted to a steel bumper or steel bumper bracket ....sister (Loesje) took out some lights at the local gas station when she left the whip up ....did it again at the hamburger drive-in ....and guess who paid ? far left - started life as a Hallicrafters S-40B .....modified with a crystal filter, additional IF section, and "enhanced tuning"....seemed like a good idea at the time, calibration took a while using the VF-1 VFO as my signal generator. bottom, right - homebrew linear with four 1625s modified for grounded grid (by separating the supressor grid from the cathode and moving it to an unused pin), a nice 866A "mercury vapor glow" power supply (900+ volts to the 1625s ....they cost $0.25 back then), most parts came from Madison Electronics in Houston ...the old location on Grey, the important thing you had to remember when you blasted a tube was to allow enough cool down time before you pulled it (experience talking). 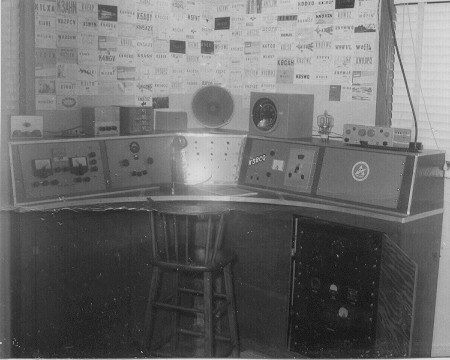 Mr Tittle who gave me my first QST (Oct 1959), gave me my first 6146, and explained why I needed a 6C4 multiplier/buffer ahead of the 6146 for all bands, especially 15m ....regardless of what the construction article said. The guy on my paper route who sold me my first "real receiver", a Hallicrafters S40-B. Frank Jackson, the electronics teacher at Pasadena HS, for his impressive demonstration in the use of a bug ....and being able to talk at the same time, his demonstration of a REALLY good receiver ....the Drake 1A, and explaining how to "cure TVI" if you have a stubborn neighbor who won't let you install a high pass filter on his stereo. Frank connected his paper tape Instructo-Graph machine to his CW rig and went outside to cut the grass when the neighbor would be listening to his hi-fi .....couldn't be Frank, there he is cutting his grass. Old man Howard of Howard's TV/Radio Repair on Spencer Hwy who gave me a part time job fixing radios and TVs, let me build his ham radio linears, and who taught me to NOT call the customer right back when it was fixed ...."wait a while or he'll think it's easy and gripe about the bill". Ray of the Pasadena ARC for loaning me his MD-7 so I could finally get on AM and talk, and for the advice installing a mobile rig. Dusty Rhoads of the Pasadena ARC for helping acquire an old scrap Motorola taxi radio for 2m ....but I never got it to work. "Wild Bill" W5DNE of the Pasadena ARC for demonstrating how to draw arcs off bug catchers with a pencil, what RF feels like off a non grounded DX-100, taping an NE-2 to your whip, and how to go MOBILE in an old red Renault by using a 1000W Dynamotor. Madison Electronics for lots of good/cheap parts and ARC-5 units. My parents for putting up with and encouraging all of this.